It isn’t the catchiest title but hey, it contains an article that just might help you stop wasting money on poor-value each-way selections. The rise of the Betfair Exchange and its Place Only option means punters now have the option of finding each way value while only risking a single stake. Does this mean the humble each-way bet is history? Of course not! The each-way bet will still be hanging around for a long time because many people still don’t bet on the Exchange and are left trying to get a decent price from High Street bookmakers. 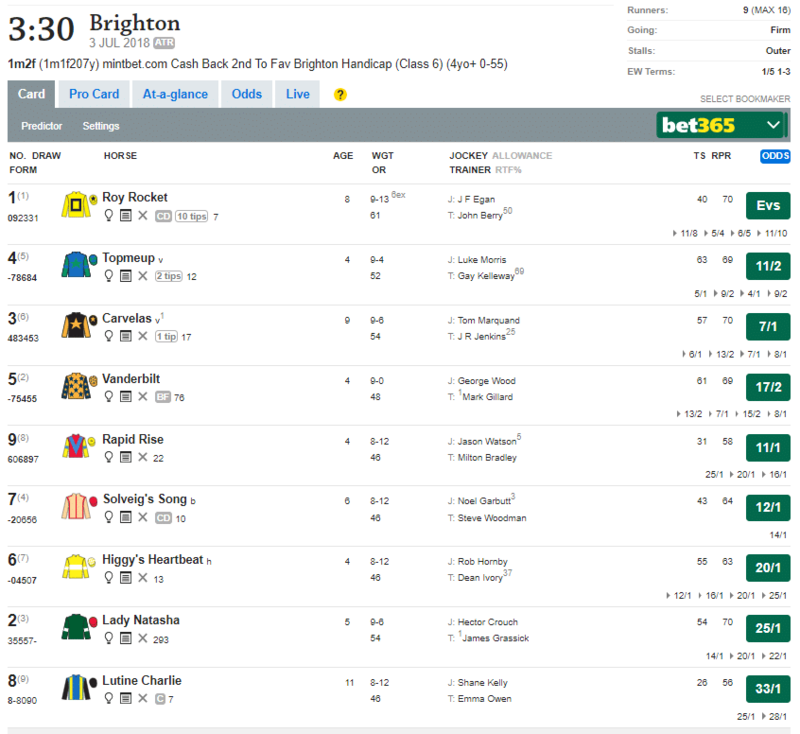 As you can see from this screenshot of the Racing Post website, there are three rank outsiders; Higgy’s Heartbeat, Lady Natasha, and Lutine Charlie. It is a nine-runner handicap which means the top three finishers will win Place bets at 1/5th odds. A one unit e/w bet on Lady Natasha would return six units in the unlikely event that the horse finishes in the top three. Since you have laid down two units overall (an e/w bet comprises two bets), you only benefit from the equivalent of a 2/1 winner should Lady Natasha finish second or third. Indeed, for races with 1/5 each-way odds, picking a 5/1 shot that finishes in the places but doesn’t win is the equivalent of picking an even money winner. Which would you prefer, an e/w bet on Topmeup or an even money win-only bet on course specialist Roy Rocket? Most punters believe that eight runner handicaps offer the best value for money because a total of 37.5% of the field will finish ‘in the places’. However, a five-runner field is potentially better value because 40% of the runners will finish in the places. Short Priced Place Bets – An Unexpected Opportunity? The average punter would laugh at the notion of backing a horse at short wins odds on a place only bet. Surely there is no value in backing a horse e/w if it is 2/1 because you only receive 0.4 units from your two unit stake if it finishes second? However, there is a theory that you should look at the second favourite in a five-horse race as a realistic e/w opportunity. After all, it is the most likely horse to defeat the favourite and should at least beat the rest of the field in the event that the top-rated horse proves too good. Also, an ROI of -80% is better than one of -100%! To analyse things further, it is necessary to delve into five-runner races. There have been 6996 such races since the start of 2010 over all codes. Here is the win percentage of each horse according to their position in the odds market (I am ignoring races where there were joint favourites or joint second favourites which is why the figures don’t add up to 100%). Therefore, horses in the top 2 in the betting win over 71% of the races. However, the best news is yet to come. Did you know 55% of second favourites in five horse races finish in the top 2? While it still leads to a small loss of 0.19% from making such bets, it is already a promising start. If you eliminate National Hunt races from contention and focus on All-Weather and Flat only, clear second favourites only win 25.36% of races but finish in the top two in 55.29% of races for a slight profit of 0.61% since 2010. When backing a second favourite e/w, you need to know that it has a realistic chance of causing a minor upset. If you look at second favourites at odds of between Evens and 2/1 SP, you will see that they win 31.9% of the 815 races they were involved in since the start of 2010 and finished in the top two in 65.52% of the races. Profit rises to 2.04%. It makes sense to look at your horse’s last race but only 54.82% of second favourites that finished in the top three in their previous race went on to place. You would hope that lower class races would also yield some clues but alas, there is nothing to report on that score. While there is no specific trend to help you enjoy steady profit, there does appear to be merit in the suggestion that you can ultimately succeed by looking at clear second favourites in five horse races. The logic is sound and I would advise you to proceed on a race-by-race basis, although it is probably best to steer clear of National Hunt events. This is especially the case over longer distances on boggy ground where almost anything can happen. It makes sense to look at five-horse races where the second favourite looks strong and at least one of the runners is a rank outsider. Only 14.47% of outsiders in the betting finish in the top two races. This reduces to 11.45% when the horse is 10/1 or longer. With one of the runners realistically eliminated, you only need your horse to beat two others to earn at least a cut of your stake. If you see a five-runner race, make sure you perform a thorough analysis of the second favourite’s claims. 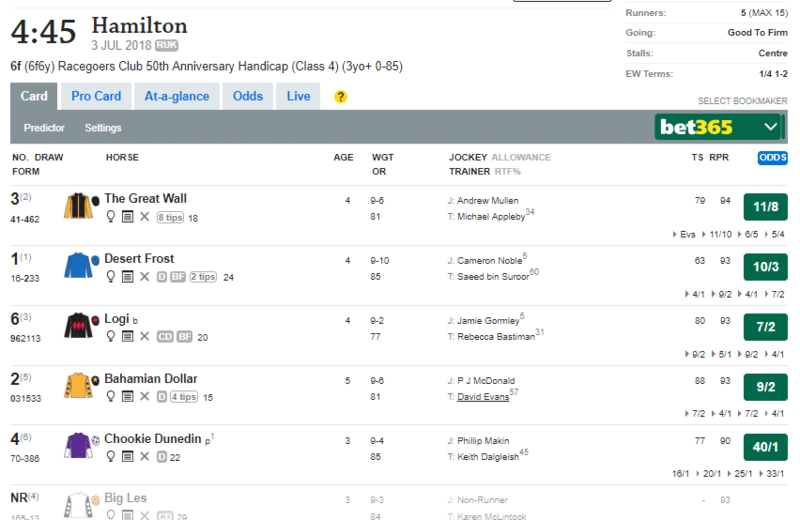 This race at Hamilton is a prime example of what to avoid (in theory). The Great Wall is a reasonably strong looking favourite and is fully expected to win. Second favourite Desert Frost could even be overtaken in the betting market by race time. Even though the rank outsider looks like a complete no-hoper, it is wise to steer clear of this race and wait for a better opportunity. In practice, this race was a rare example of horses finishing in the precise order of the betting with The Great Wall as winner and Chookie Dunedin a distant last some ten lengths behind. One final word: make sure you focus on races where e/w bets offer 1/4 odds to boost your profit.